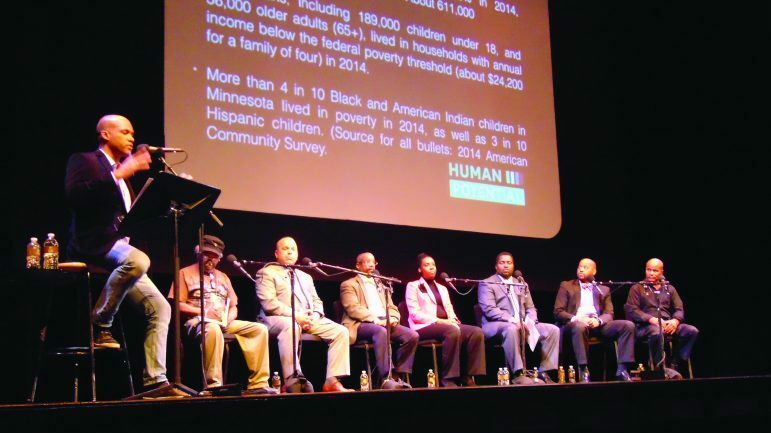 An almost two-hour “school-to-prison pipeline” dialogue wasn’t expected to reach a solution, but organizers and attendees both say it was a good starting point for future discussions on the subject. Panelists included University of Minnesota Equity and Diversity Assistant Vice President Shakeer Abdullah; St. Paul Police Chief Todd Axtell; Save Our Sons Founder Melvin Carter, Jr.; Hennepin County Juvenile Judge Lyonel Norris; Michael Walker, who is director of Minneapolis Public Schools’ Black Male Student Achievement Office; Taska Welters of Hennepin County’s Juvenile Detention Alternatives Initiative; and history professor emeritus Mahmoud El-Kati. If a child spends one day in juvenile detention, the likelihood of the person later returning to an adult detention center is greater, stated Carter. The “pipeline” actually starts before third grade, the grade in which educational experts claim Black students start to show a decline in their academic achievement, said Walker. A White woman in the audience early on boldly urged the panel “to drill down” to the real culprit — racism. Given the subject matter, it was noticeable that the audience wasn’t as diverse as you’d think. Tarkor Zehn of Brooklyn Park said, “I think [the lack of diversity] is a good thing. We [as Black people] know what the issues are. I feel like the conversations that White folk are having and what Black folk are having are two separate conversations. If we can figure out a way how to channel that in a forum,” she would support that, she said. Zehn suggested that more talks should be regularly scheduled, perhaps on a monthly basis. “It should be a monthly series with different talking points” on various educational issues such as school suspension, or one of the many other topics brought up during the event. “We have to continue that conversation,” she added. “We have some work to do,” concluded Smith.